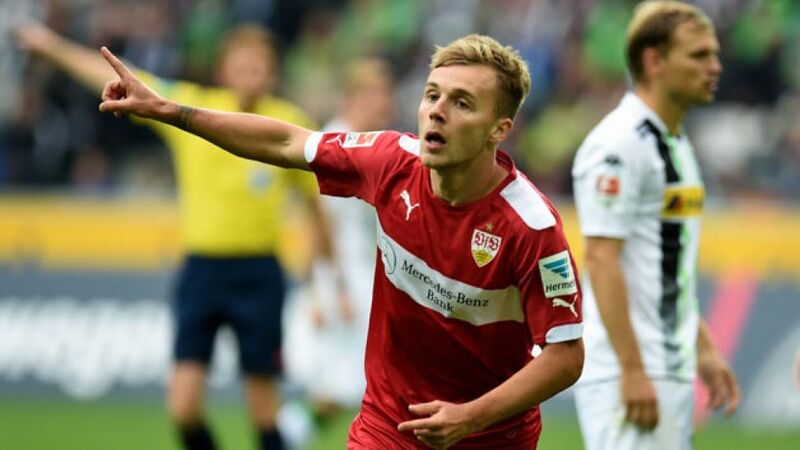 Mönchengladbach - Borussia Mönchengladbach substitute Christoph Kramer scored a minute from time to deny VfB Stuttgart all three points in an enthralling 1-1 draw at Borussia Park. Alexandru Maxim's 50th-minute strike looked to have won it for the visitors, who were caught cold at the death by the game-changing impact of Gladbach's very own FIFA World Cup-winning diamond in the rough. With Marc-Andre ter Stegen jumping ship this past summer, new Foals goalkeeper Yann Sommer made his first league start in a Gladbach shirt along with fellow summer recruits Ibrahima Traore and Andre Hahn. Florian Klein and Oriol Romeu were also handed their debuts on the other side of the fence for a Stuttgart side without an away win this calendar year. The fresh faces still bedding in, potshots were the common currency in the opening stages, before a much-needed moment of invention involving former Stuttgart flier Traore and Havard Nordtveit very nearly blew the lid off the sold-out Borussia Park. Branimir Hrgota was the beneficiary, only to be denied a clear sight of goal by a wonderfully timed challenge from Daniel Schwaab. Gladbach's Tony Jantschke put his body on the line in similarly heroic fashion at the other end after Daniel Didavi's ingenious flick sent Gotoku Sakai scampering, invariably on the lookout for Vedad Ibisevic in the six-yard box. Antonio Rüdiger went one better from a Didavi free kick in the 31st minute, but his net-busting header was ruled out for an offside decision against Christian Gentner. Raffael missed a golden opportunity to send Gladbach in at the break a goal to the good, but an even better chance fell by the wayside early in the second half. Nordtveit supplied the pass after pouncing on a misplaced kick from Stuttgart goalkeeper Sven Ulreich, who got off very lightly indeed as Hrgota somehow contrived to shin the ball wide of the unguarded net. Fortunate still to be on level terms, Stuttgart made the Foals pay for their profligacy in the 50th minute as Maxim collected Gentner's dinked pass and rifled past Sommer with aplomb. Hrgota thought he'd atoned for his earlier miss moments later, but the linesman's flag once again went up to deny Gladbach their first Bundesliga goal of the new campaign. Lucien Favre called on World Cup heroes Kramer and Fabian Johnson in a bid to turn the tide, with the former's classy chipped pass freeing likeminded substitute Thorgan Hazard. The Belgian loanee could only find the upright, but with time ticking away that man Kramer stole the back-page headlines, sliding home from Alvaro Dominguez to rescue a deserved share of the spoils.